Capcom’s horizontally scrolling blaster has you take control of a flying warrior with a Space Harrier style jet-gun thing. Your journey takes you through strange landscapes, from ruined cities to Egyptian tombs. As you fly around, you control shot direction by rotating left or right, allowing you to a 360 degree range of fire. You also have a handy satellite that follows you around, adding to your firepower. This, among other things, can be upgraded in a shop where you can spend all that zenny you have been collecting from your kills. Shops pop up at specific points in each level, so be sure to have enough cash for your gear, armour or health potions. The first thing that strikes you about Forgotten Worlds are the impressive graphics, which despite the lack of parallax scrolling are very close to the original arcade version. The second thing that strikes you is the overly fiddly control system, particularly if you don't have a 3 button Avenue pad (unfortunately the 6 button pad does not work correctly). It gets to be a bit of a nuisance to aim where you want at times and so you'll find yourself rotating purely in one direction if you are feeling lazy. But despite this minor niggle, it is a remarkable conversion. As mentioned, the graphics are great (a little flicker and some slowdown the only bugbears here) and the music deserves a special mention. 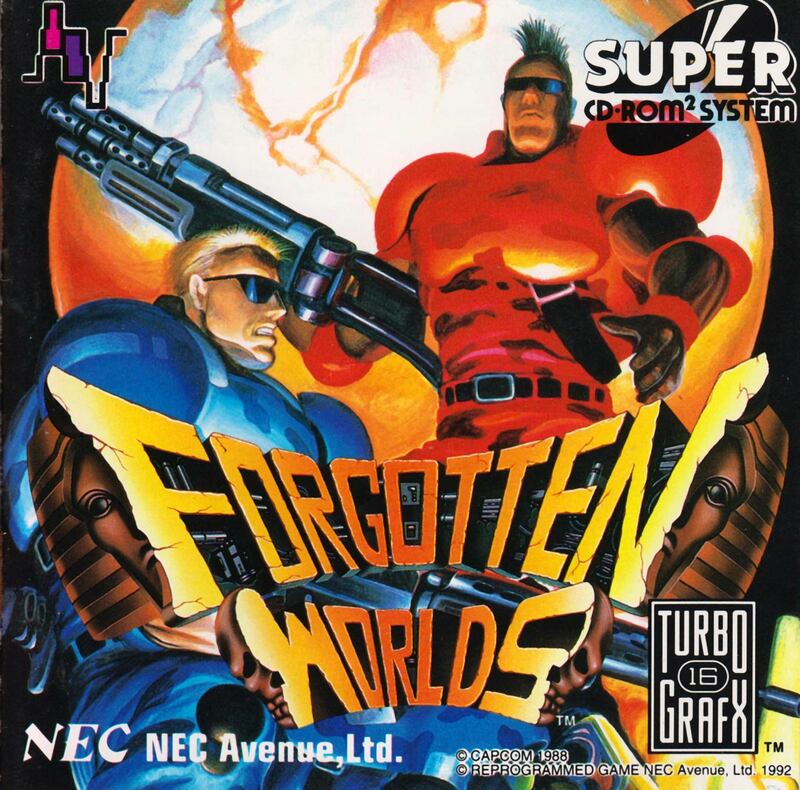 Forgotten Worlds has always had a quite unique soundtrack for a game, and NEC Avenue have arranged this particularly well, and it's certainly worth a regular listen on its own. The game itself peaks and dips with certain levels, the most entertaining being the first few, with the Egyptian styled levels being fun, but slightly less so. Bosses are imaginative and have pretty much gained classic status in the world of video games, along with the goofy dialogue at the end of each level. You also get the option of choosing the poorly sampled arcade speech or some nice crisp new speech which sounds an awful lot better. The game is more challenging than the Mega Drive version and a lot more faithful and will definitely keep fans of the original happy. 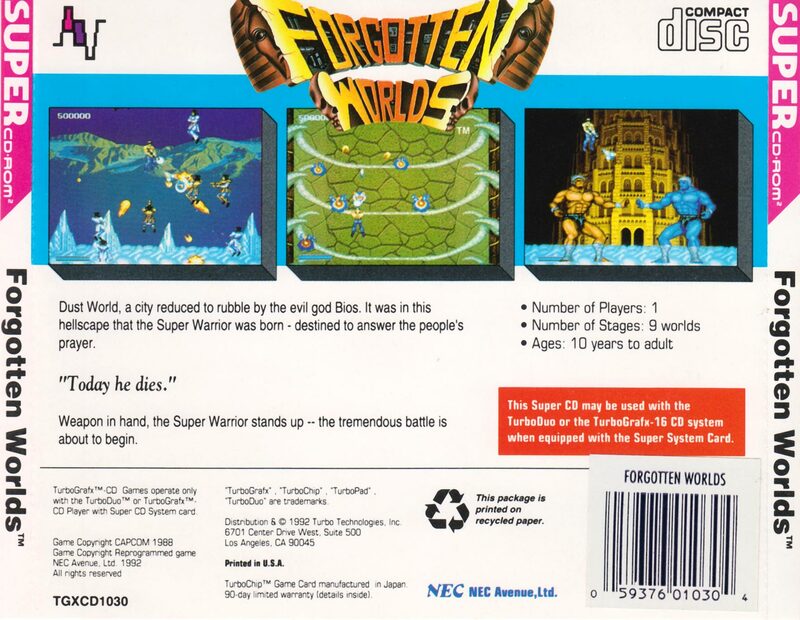 If you liked Side Arms you can’t go far wrong with Forgotten Worlds, and if you didn’t - well, this shows how it should have been done. Forgotten Worlds is a Capcom arcade conversion, and a very good one. You feature as one member of 80's UK boyband, Bros, who can inexplicably fly through the air firing lasers through a length of PVC. The first thing to note is that it's a really close conversion, graphically. The Mega Drive version, while no slouch, definitely isn't as well presented. The second thing, is the controls. The game came bundled with a three button controller as a "big box" version, and the idea is that you use one button to rotate clockwise, another to rotate anti-clockwise, and the last to fire (I don't know how it works on a two button pad, but presumably not as well). The game was also one of five compatible with the Micomsoft XE-1 AJ Intelligent Controller via the X-HE3 - a full-on analogue flight stick. The game itself is a decent shooter, and it features one of my favourite things - an in-game shop. I could write at length upon how good in-game shops are (properly implemented). 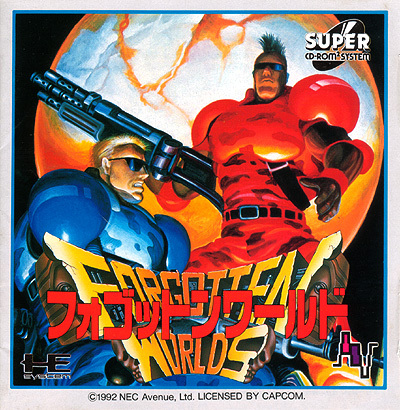 The game is graphically superb, and the title also features a choice between original and remastered sampled speech.